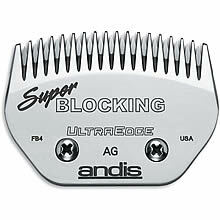 Andis Super Blocking Clipper 64340 Blade - Leaves Hair 1/100"
Blade Description: Chrome plated, carbon-edged replacement blade set for Andis detachable blade clippers. Used for removing bulk of hair, pattern lines on large breeds with lots of coat. Can also be used with other brands of detachable type clippers. The benefit of owning a detachable blade clipper is that many optional blades fit one clipper.